After creating a survey you'll be directed to the Question List page for the survey. 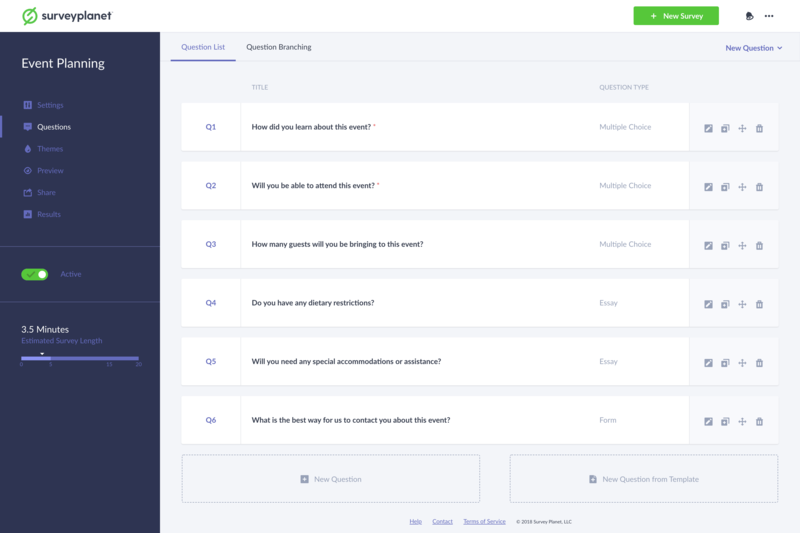 This is where you will create, update and manage all the questions for your survey. On this page you can see the Question Title and Question Type as well as icons to Edit , Duplicate , Move and Delete the questions. If you need to delete a question on your survey, click the Delete icon next to the question you would like to delete. Be aware that once a question is deleted it cannot be recovered and the answers for that question will be removed from the question results summary. The answers for the question will not be deleted, however, and you can still view them on each participant's details page. If you need to duplicate a survey question, click the Duplicate icon next to the question you would like to duplicate. After you duplicate a question, you can go into that question and make any edits you would like. This is often helpful if you have the same follow up questions in your survey or have set up a question and need others like it. To edit a survey question click the Edit icon . This will take you to the question edit page for that question where you can make any necessary changes. You can easily rearrange the order of your questions by using the Move icon . Click and hold the icon while dragging the question to where you would like it to be.